When attending college, dorm shower shoes in the shared college bathrooms are an absolute necessity. College dorm showers are not always known to be a hygienic place and you should never use them while barefoot! Our Showaflops - Men's Antimicrobial Shower Sandal in Athletic Stripe is specifically designed for use in the communal college bathrooms. These college shower sandals help keep you clean and safe in your dorm shower! The most annoying thing about wearing plain college flip flops in the dorm showers is how slippery they become! As usual, DormCo has your solution. Our Showaflops have unique draining holes and a textured pebbled surface that gives you extra traction when walking around in the shower, beach, or gym locker room. But the good news doesn't stop there. 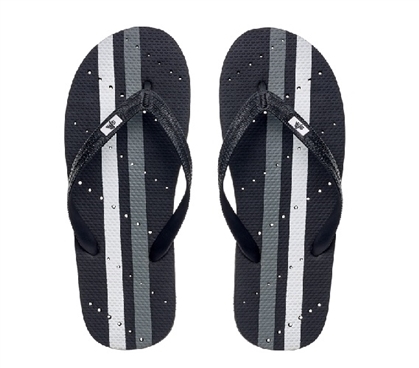 Our college shower sandals have deep diamond grooves on the bottom that provide even more traction and prevents you from slipping on slick or wet surfaces in your dorm bathroom. Our classic flip-flop style makes it easy to find your dorm shower shoes and are stylish enough to be worn at the beach, water parks, pool, or gym shower and locker room. Don’t risk exposing yourself to water-borne contagions in the residence hall bathrooms that can really mess your style. With our anti-microbial Showaflops, you can always be safe and sanitary in your college dorm shower!